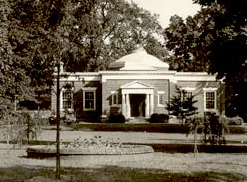 The library has served the Haddonfield community since 1803. Today, there are approximately 120,000 visits from the community each year. More than 800 children and teens participated in the 2010 Summer Reading Program. According to the Library's website, Haddonfield has many talented residents and former residents who contribute to the library’s adult and children’s cultural programming, including: Thomas Belton, Robert Byrd, Buntzie Churchill, Dan Gutman, Alan Heavens, Monica Yant Kinney, William Meehan, Douglas Rauschenberger, Megan Smolenyak, Kathy Tassini, and Toby Zinman. Many of these authors have donated autographed copies of their books for sale. The Friends of the Library hold a huge annual book sale, usually in the middle of September. For more information, visit the Friends of the Library website at http://www.hfol.org.